Projekt Wolfenstahl: How to choose character order? Looking forward to more info, and a potential release date. I have no real objections to the order of characters for stretch goals, but I am curious as too how far apart each stretch goal is. It's difficult to give a potential release date, as we're only able to pick up work in about ~2-3 weeks. But I think it's a good idea to concentrate on creating a working demo version in order to get more public attention. "If" we release a working demo version, we will try to get as much of the actual gameplay in as possible. I really can't say for sure, and I don't want to make any promisses. "If" Ferania needs about ~2 months for completion (sprites, all the CGs etc. ), we would aim for the other characters stretchgoal to be 5000 $ on Offbeatr (I heard they take roughly ~30%, so we get 3500 $ out of this). That means, every 5000 $ a new character gets added to the game. But, since we don't know how long we need for Ferania, we can't say this for sure right now. So, I don't think that we will get the whole character list into the game. But it would be cool to have 3-5 characters in there. And btw. yes, if people are interested in this game and the other characters, we will most likely do a second Offbeatr campaign to add more characters to the game. But only after we've implemented all the characters from the 1st campaign. Please keep in mind, that this is just a rough plan, and it's nowhere final. We'll have to see how things turn out in the end. This is a bit off topic, but seeing a bunch of characters at once made me notice something I subconsciously think about. So, I'm curious if there's any particular theme you're going with per character. Are you making a personality from a picture or are you making picture from a personality or both? When I look at the characters and their design/description, I can see how the pieces fit and the like. I'm not looking for any secrets or anything, just really curious as to how your mind works. I'm getting the feeling that Chrysoula is going to be a little haughty. Nothing extreme, but I feel it'll match with her being "above" people all the time. Makes me also feel that she'll be smarter than most. As for her hair, I feel as though there's a missing purple in there somewhere. There's also the chances she's one of the subversions and she's the exact opposite of what I said. I kinda just wanted to throw a guess out there. In any case, I'm super excited for everything about this game. And as for your list order, I trust in your judgement. Though, I will say, must...get...to...7. Usually we make a picture out of a personality, and then after the picture is done, I'm further working on the personality. So we have a general idea about the characters traits or looks already, before the drawing starts. There are cases however, where a character is being created by "accident". By that I mean, it starts as some random warmup sketch, and she looks so great that we actually make an original character out of her. In this case, we often do adjustments afterwards as the personality gets developed. Yes, I imagined her to be a bit haughty. I can't say much about her, as she's one of the characters that happened by accident (Cres wanted to design a harpy monster for the game, but she ended up looking too "good", instead of evil, and since her design was great we ended up turning her into one of our characters). We haven't worked much on her, but we will do so in the upcoming weeks. And yes, I would love to have Chiira in the game too! I'd like to say that the dragon girl would make for a wonderful final character. It's just a bit sad that she will be at the very end of the stretch goals, which likely means she'll never make it into the game, judging by past projects. Unless you're one of the rare few that make the stretch marks reasonable, and not 5-10 K apart. Yes, it's difficult to say if the last characters make it into the stretch goals. But there's a chance that I still make changes to the list. We will try our best to have the stretchgoal marks as low as possible, however, we don't want to risk making a game that costs us more money than it earns us. When we go to Offbeatr, we will put the game there for the lowest goal possible (I believe that's 500 $? ), as it should be already done or nearly done by that point. So... basically the "base game" isn't being financed by the Offbeatr campaign, but every character addition is. This way we can add new characters to the game, without taking financial risks. I understand that most people would like to have all characters in the game (I do would like that myself), but unfortunately we can't do this without proper funding. Offbeatr taking ~30% of the money is another issue, this actually has a huge impact on the stretchgoals. So, while I understand that reasonable (low as possible) stretchgoals are important, I also hope that you can understand that we need reasonable funding as well. PS: BUT IF you choose something from me THEN please do it like this (well if you want to =P: Lion Girl (a lot of Head hair (Fukuhila?) even if it is the Female^^) - Dog Girl: Like a cute Little girly with a cute Dog Tail and Dog ears - Snake Girl (nagga?) with mean Eyes You shall see that she iss a Dangerous Snake >= ] - Spider Girl: (since I doupt that you choose her I don´t know what to say XD) well just the higher Body of a Girl and lower Body of a Spider (and if then like the snake with a dangerous look >= ] (please in black) - Butterfly Girl: A Girl with Butterfly Wings and perhaps antenna (and a cutey face^^) Hornet/Wasp/Bee: hmm perhaps just like Queen Bee from darkstalkers (A woman with hair at some Body parts antenas and a big fed Sting at her A**) Panda Girl: Since you already have a Bear you know how (a Panda would be just in Black and White XP) Horse Girl: With hair tale big Horse ears and äähhh . . . . . hooves . . . ?? . . . -.- no bad Idea I know! >.< (well if then with dark Skin perhaps) Bat Girl: Hmm it could be White Skin (or even violet) and Sharp fang (just like the harpie but with skinny Wing) AND (a mean look XP) Mermaid: well you know what a mermaid is soo (on land pehaps with standart humen legs) Mole Girl: Perhaps Little and with dark Skin and sharp Claw perhaps? Thank you very much for your suggestions, but I think I'll take some of the characters that I already have. Among them are 3 dragon girls, a cowgirl and a panda bear girl. 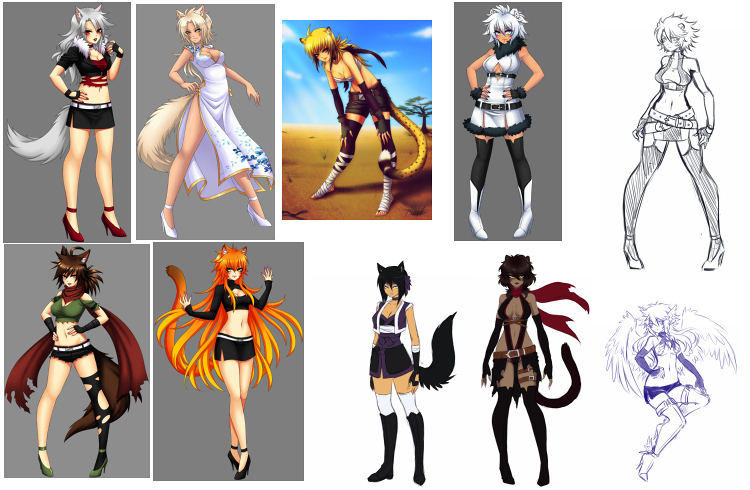 And... lots of others, several wolves (but there are enough of them in the character list already), 2 jackals, foxgirls etc. etc. So, I'm going to choose one of our existing characters, but I'm not sure yet which one. You mentioned something about grabs earlier and I was wondering about further details on the grab system. Will it be like paperheads or will it be quicker? I imagine with many characters and sprites to take care of, it will be be a standardized system. I'm sorry for going off topic and this may be a strange question, but is it possible to re-upload one of the old beta demos for Paperheads? I figured it would be a good idea to rework the grab system in this game. I wanted it to be quicker/easier to use. Like only pressing the displayed directional buttons to free yourself and damage the enemy. Or button mashing 1 button to get free. So, it will be similar to stuff other games do. But I'm thinking about a way to have something special here, that can be choosen as an alternative for players who want to do something else than simply button mashing. I can't say much on how it will be "standardized" yet, but yes, having a lot of characters in the game, requires some degree of standardisation, else it would be too much work to actually do it. I'm sorry, I don't have access to my desktop computer where I stored the old backup files right now. So I can't re-upload it. I'm sorry I can't help you with that. But maybe you can ask on the ULMF forums if someone has the old beta demo? Good to read that Cres' arm is almost fully recovered. And happy to see some progress in the project, at least we see most of the cast ^^ Well about the fox girl or dragon girl... I would go Dragon, because well we have enough mammals to go around so how about a mythological creature X)... Anyhow, I would suggest for which order the characters should be...'Selected' would be based on a poll, the one with the highest, gets funded after Ferania, then so on, and so forth.. Cheers can't wait to be able to help fund this project. We already thought about doing a poll, however, this is a bit difficult. Please let me explain this in detail. First of all, we already included Ferania as first character and Catheline as second character (they both also won the previous poll). We thought about probably doing a poll to enable our fanbase to choose the 3rd or 4th character that gets added to the game. But we believe it's necessary to decide which other characters get added to the game by ourselves. The reason for this is because we created those characters with different strenghts, weaknesses, and most importantly certain gameplay aspects in mind. This means, it would be a bad idea if the community chooses mostly characters that are close combat based, as they all would be very similar to each other. Another downside to letting the community choose would be, if like ~60% of the people like blonde characters more, so characters like Aurora, Chiira etc. would be on top of the list, while brown or black haired characters are at the bottom of the list. And yes, I'm well aware that it's impossible to make everyone happy. I'm really putting a lot of thought into it, trying to "balance" it as best as possible, so hopefully there's at least one character for everyone. And of course we shouldn't forget the gameplay aspect as well. I think it's a good middle way to let the community choose the 3rd or 4th character that gets added to the game (this means position 4 or 5 on the list, since Ferania, who's already in the game, has position 1). And, depending on the votes on that poll, I "could" still slightly adjust the rest of the list. Of course I would still need to keep the gameplay aspects in mind, so I can only make minor adjustments to the list. And uh... lets imagine we would put up a vote for the 3rd character that gets added to the game. with this, it's pretty much clear that the 3rd character should be a "Balanced" character (which means, she should have ranged attacks, or "maybe" a close-combat character with a more unique playstyle). This means, brute force polar bear Esmoda wouldn't be up for the vote. But maybe Shiwa because she's at the back of the list, so she has a chance of making an appearance in the game. Maybe Sanura too, because chances that she gets into the game are pretty low too because of her positioning on the list. So I think, I'll put up every "balanced" character up for the vote. As well as the characters on position 9 to 12. And if one of the close-combat characters wins the vote, I just need to slightly adjust the list or something. I see, and thanks for clarifying that 100%, I admit, I didn't anticipate the unbalanced part of the poll idea, so thanks taking the time to do an elaborate answer. Reading it like this sounds a lot more balanced. But is there a demo for this game or a way to donate or buy It? There is no (public) demo yet, and also no way to buy the game yet. I'm sorry that I can't announce a date for the demo at this point. But I'm trying my best to keep everyone informed on a regular basis. I understand your reasoning for the polls, as the thought of potentially heavily-stilted gameplay made me reconsider the suggestion. I like your response, but it prompts me to wonder: why not have more suggestions for the polls based on "roles"? You already mentioned potentially using polls for the "balanced" characters, so why not use small pools of similarly typed characters for the other areas? This way, you wouldn't need to worry as much about an imbalance in gameplay, and if you reserve, a couple of author's pick (maybe 6/10), you can have a hand in maintaining visual differences as well. Please consider this nothing more than a polite suggestion, feel free to consider or ignore as much of this as you wish. My only issue with this idea is that some people would clearly want certain characters more than others, and that would directly affect their pledges in offbeatr. I know I, for example, would pledge much more to ensure that Stella was going to be in the game than, say, Esmoda or Grizelda. To get around this, I would suggest having any polls finished by the time the campaign starts, so that pledgers would know the exact order of characters, though the order to determine those characters is entirely in your hands. Phew... that requires us to do a whole lot of votes. It's not a bad idea, but it can be complicated and somehow I get the feeling that I forgot something important. Anyway, we're going to give this a thought. I can't say for sure if we do it this way or not, but at least we'll give it a thought. I mean, there's also the problem that if we do it this way, the game might be balanced gameplay wise, but (most likely) not hair-color and skin-color wise. Which I also wanted to "solve" by deciding the order of characters by myself. So, from todays point of view, I guess it's better to not give the players full control over the character order. If I'd do that, everyone can give 1 vote to each position. And if the majority of people (lets say 60%) like blonde characters, it's possible that all votes might be won by blonde characters. Which in turn means, that the other 40% who like a different hair color don't get what they want... which is... not good. Either I let the people decide on it, or I'll decide on it myself. So, I "could" do some big character list voting to see how popular each character is in a couple weeks (similar to the last poll I did). But I'd only do that as orientation, not as... uh... obligation. This whole character-list-voting stuff is pretty much very sensitive and I kinda fear that it could backfire. I mean, if I decide on a list and people don't like it, that's one thing. But if I let people decide the list by voting, and they don't like the outcome, I think the disappointment would be a lot bigger. Uhm, whatever, we'll give this a thought and decide on what to do in the upcoming days/weeks. I'd say, it's pretty much guaranteed that we're going to do "some kind of poll" sooner or later. How much that poll impacts on the character-list however, is something I can't say right now.